Purchased this car seat and it immediately started rattling in the car. Tried everything to stop it including stuffing a rag behind the adjustable headrests/harness strap. That is what is rattling. The rattling is so loud it can be heard over the radio. I thought maybe I just had a defective one but I have swapped it out THREE times and have the same exact issue. I started thinking it was just this model so we bought a Graco Sequel 65 and it rattled even worse! So we thought maybe we would spend more money and decided to get the Graco 4ever and it rattles too! We finally decided to go with another brand that also has the adjustable headrest and harness and it's solid and does not make a noise. These car seats are just made very cheaply. I have this for my one year old and recently bought one for my niece because I love it so much and wanted her to have the best of the best! This a great comfortable car seat and the price is right! I highly recommend!! We are pleased with the car seat. It was in a price range that we could afford while also being safe for our little one. I would recommend! I bought this carseat for my husband's car, and we love it. I use the 4ever Extend2fit for an every day carseat in my car, but this model is just as impressive. My son seems very comfortable, and the carseat is very sturdy and stable. It is a great fit in my husband's smaller sedan. 100% recommend! Great seat. 2nd one we have bought for another vehicle. My only complaint is how large it is but on the other hand my child is comfortable and Safe! Love this car seat! I was in search of a convertible car seat as my granddaughter is of an age to ride forward facing, now. I also wanted something that would last for the next few years. This car seat is very nice looking, of wonderful quality and it is so simple to use. Whether I am switching the seat from rear facing to forward facing, or vice versa, it is so simple to do. Also, the shoulder and lap strap adjustment is super efficient. This grandma has never experienced a car seat that is so user friendly. I would definitely recommend this to family and friends. I bought this seat for a grandchild where I have to switch seats often. The main draw was the lighter weight (easier for switching) than many convertible seats, ease of installation, and the price. These are all good. My one complaint is what many have expressed, seemingly for years. The button to loosen the straps when taking the child out of the seat is very very difficult to access given its location right up against the back seat when in the rear facing position, and that it is all covered up. I don't have to use this seat everyday, but if I did this annoyance would keep me from buying this seat again. My daughter and I looked at many car seats and she picked this out for the great features and for my car. They bought a very expensive car seat and love mine so much more! Very slight head incline but enough her head does not fall forward. We bought this to use as a backup in our second car. It's easy to use and install and is lightweight which makes it easy to travel with! We like it because it is easy to use when we are in someone else's car as we can use the seat belt to secure it. The only negative thing I can say about it is that the area where you have to push to release the straps is a bit awkward, you have to have your thumb at the right angle in order to be able to press it. But other than that we are happy with this purchase! I was looking for compact yet comfortable car seats for my 9 month old twins.. Loved the size and quality. I think we'll get several years of use out of them. I have Contenders for both my kids (one rear-facing, one forward-facing) and we are so happy with them. They're easy to adjust/remove and clean, as well as comfortable and secure. I love how this reclines, when a child falls asleep in this chair (like they always do) their heads are so much more supported and does not strain their neck. Very easy to clean. I love the design of this car seat and it's easy to install. I love how easy it is to adjust as they grow! Super comfy for my little one too. So comfy and stylish!! My little man loves his convertible chair and rides much more comfortably. This carseat is great! Superior padding. Very easy to set up. We will get many years use out if this. My son absolutely loves his new seat. It is the perfect size also. The seat I have for my daughter is big and bulky, his seat has the same rating as hers and is more compact. I will be getting her the same seat. Bought this almost a month ago & i love it! I just wish it had 2 cup holders instead of 1. I bought this a few months ago since my child is going to start growing out of his current infant car seat. He likes the seat and he is able to move around and stretch without the canopy or a handle being in the way. This careseat is very comfortable for my grandson and easy to use. I feel he is very safe in it. Great, simple, easy to get kiddo in and out. Both this during a sale, excellent purchase. It's very easy to use, easy in and out. I can't believe products like this don't cost a lot more. It's got enough room to easily maneuver kiddo in and out without extra time and fussing. Easy to install not too heavy. Purchased direct from company. It took longer to receive due to flooding in California. Once I got it I was pretty pleased with it. Only problem was the bottom buckle is too far down but took out the extra padding and it came up further off the leg/hip area. Good for parents and kiddos! Our family has loved this car seat! It was easy to install, which was a plus since our previous car seat was not. It was quite comfy - our one year old slept through all of our longer trips (3ish hours) and even some of the shorter trips, despite him not being the greatest car sleeper. It was easy to adjust to fit our son just right and the cup holder was convenient for holding drinks/snacks/toys throughout our trips. It's also much easier to keep clean than our last car seat. Overall, a great buy for our family! Purchased this about 3-4 months ago and it is really nice. it is convertible to sitting position as well as lay down positions. I have had this car seat for almost 6 months now and the only complaint I have is that the strap to tighten the seat down is hard to pull. Other than that I feel that my child is safe and comfortable. I bought this car seat when we transitioned from the click and connect car seat carrier to a suitable car seat for a toddler and I love it! It has a comfortable amount of space for my daughter rear facing and the cup holder fits all of her various sippy cups. It's easy to take off the cover to clean in the washer and/or spot cleaning. Overall, very happy with this car seat. We bought this for our big man almost two weeks and he loves it! So of course we love it too. Thanks Graco for a great price and comfy ride for our big guy. We needed a second car seat for hubby's car and this seat just happened to be on sale. Once we got it I noticed how big and comfy it was for our growing boy! It is sturdy and spacious. We love it! I bought this for my 3 year old, and feel good about the security features on this product. It buckles in tight onto the seat and even he's big for his age he fits nicely into this one. The solid construction of this chair gives us such peace of mind that our littles are properly protected if ever the need should arise. We love it so much we got a second for our other car! We bought this as a travel seat, but it's now become our default seat. 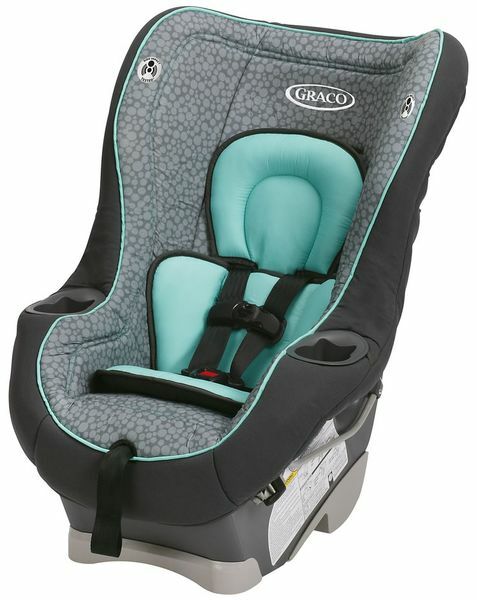 It's not too heavy (15lbs, not difficult to move around with the help of a cart or luggage strap), installation with a seatbelt is straightforward, and it's wide enough on the inside to make my big toddler comfortable. This car seat will get my child through till she doesn't need one any more! Great purchase. We've owned three of these, and I love them. They are so easy to install, and not so large they are hard to fit with other seats in my Dodge Grand Caravan. My 5 year old is still forward facing in hers comfortably and I love that it took her from birth to now safely. I will order another one soon for new baby on the way. Bought it for our 1 year old to make the infant seat available for our newborn. My daughter loves it and I'm happy I can keep her rear facing. I have three kids in car seat and a four door sedan. I needed seats that could fit three across in the back seats. There were perfect. They only measured about half an inch wider than any of the 'slim fit' models I researched and had better comfort and price point. I am very happy with these. I have one forward facing, one rear facing and one booster with harnesses snuggly but safely installed. The car seat is not too big, simple but effective with one cup holder, and fairly easy to install. The one absolutely horrible aspect is the release for the buckle. I still have no idea of the best way to push it without almost breaking my finger every time. If I would have known, I would have willingly spent twice the amount for that functionality. It's an excellent choice because it's super functional for newborns to toodlers! I'm so happy with this! Took a long time to decide which car seat to get but the Contender was the right pick. My grandson has used it a month now. He's more comfortable with room to grow. Fits great in the back sea. He loves the cup holder and the fact that he can see us now. We bought this for our baby who is about to turn 1. He is very tall and it gives him plenty of room while rear facing. It feels very sturdy and was easy to adjust. The only thing that keeps me from giving it a 5 is its size. It's very large and laid back. I drive a smaller car and it takes up around half of the back seat. I have no room in the passenger seat either. My 15-month daughter loves this car seat; she feels very comfortable in it. I bought this car seat because my other one expired. Very happy, easy to adjust fit. Very comfy i like the belt its long so its easy to buckle n make it tight. Easy to install using the latch system! And love how easy it is to adjust the headrest with the harness! I love this car seat, and so does my 18-month-old son. The car seat is comfortable to put in the car. I love that the car seat is comfortable and adjustable. I highly recommend it. Getting it into our car was a challenge because the latches are just barely long enough to reach. Besides that, I love everything else about it. The height adjustment is extremely easy. Our boy loves it too especially the cup holder.